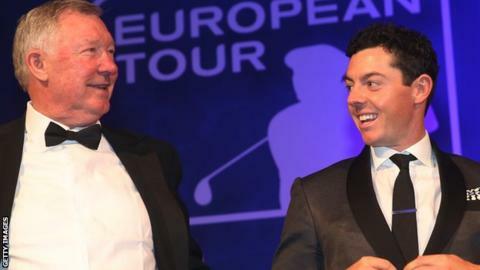 Northern Ireland's Rory McIlroy has been chosen as Golfer of the Year and Players' Player of the Year at the European Tour Awards. The world number one secured the double after a year in which he won the Open and the US PGA Championship as well as playing in Europe's Ryder Cup triumph. The 26-year-old's last 10 European Tour finishes have seen him claim five victories and three runners-ups places. "I am just trying to keep going and increase that tally," said McIlroy. "There is a lot to play for this year. I have got off to a great start and I just need to continue that." Brooks Koepka, from the United States, was another double winner as he received the Sir Henry Cotton Rookie of the Year Award and the Challenge Tour Graduate of the Year Award, after winning November's Turkish Airlines Open to go with four other top-10 finishes. There were also celebrations for the full Ryder Cup team, while Welshman Jamie Donaldson won the Shot of the Year award for the approach which sealed the winning point at Gleneagles. The European players were joined on stage by former Manchester United manager Sir Alex Ferguson who was invited by captain Paul McGinley to address the team before the start of the September 2014 contest. McIlroy noted: "Even with all the personal success I have had over the past year, the Ryder Cup was the most enjoyable week."